Photo and article by Paula Erskine. I met an Irish priest on one of my flights who invited me to visit his mission in Ngoundere, Cameroon. There was no way to send word as internet and phones were not available at that time. So one day I flew into Ngoundere airport and asked someone to drive me to the mission. It was a bold move on my part, but I did receive that broad invitation, so I grabbed it and dropped in. They seemed glad and the touring began with a trip to Berem village down a dirt road into the bush. It was just my fate to arrive when I did and discover these beautiful people resting after a long journey. I was told they were from the Bororo Tribe (nomads). They were travelling with their children, grandmother, cow and no men in sight. Some of them had very light eyes and lighter complection. Their clothes were very colourful, almost Indian especially the tops they were wearing. Their faces were tatooed for decoration with plant extracts, although this did not apply to the children or the one teen-ager that travelled with them. I tried to ask for permission to take their photos as best I could. This woman was the only one who smiled at me. But why should they? It was west Africa. They were tired from their journey. I asked and pointed at the flat, beaded covers on the bowls. They moved one cover and showed me the butter. I wanted them to know that I admired them for being so strong, so beautiful and incredibly resilient. On the way home, we picked up a hitchhiking woman from a different tribe on her way to market to sell some silver jewellry to raise money for a wedding. The driving, translating priest helped me to negotiate for some exotic bracelets. The woman said I could bite it, it was solid silver. It was coiled over and over delicately and attached with chains to rings that formed daisies made from more coils. That was a fateful trip where I invested in handmade, priceless adornments and bought most of her collection that would be sold at the market we were taking her to. I was amazed that the priest could communicate, joke with both of us and drive a roughed-in road at the same time. 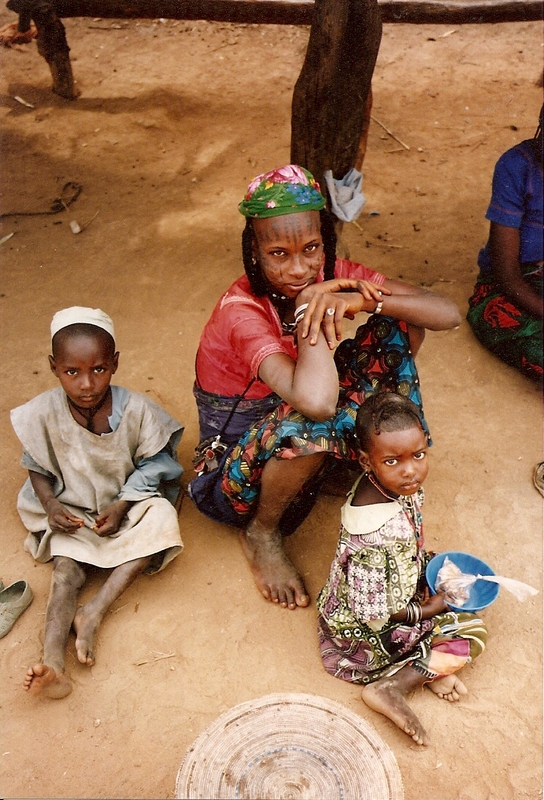 Shopping in a pick up truck with a personal translator in Africa was one of the best experiences I had in Cameroon. It was a long, perfect day with much more to tell.